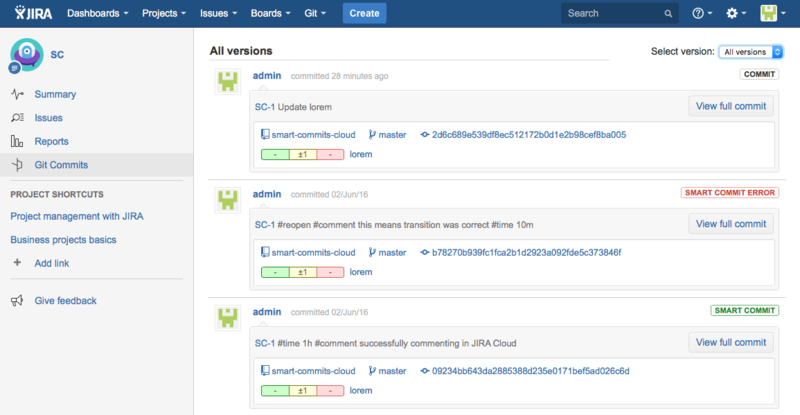 See Git commits in Jira. configuration page under Actions > Edit Integration Settings. In Jira Cloud, this setting is always enabled. The Jira DVCS Connector Plugin is not required. 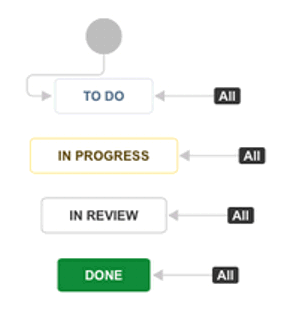 The Git Integration for Jira app has the functions of the connector plugin plus more integration support and features. Your Jira e-mail address and Git commit e-mail address matches. The commit author's email should match exactly with a user's email in Jira. If they do not match, the application will add the commit as the app. E-mail address is not shared by other Jira users. Verify that this email address is used by only one Jira user. Advanced: Verify that the workflow conditions and validators are able to process successfully. In the above example, the commit is associated to TST-123, adds the comment "fixed bug" to the Issue > Comment tab, logs the time of 1 hour and 30 minutes with worklog comment "Bug fixes", and adds fix version "release2.3" to the issue. The above example is a valid multi-line commit message. The first smart commit line uses the Jira username to assign issue TST-123 to that user. The second smart commit line uses the Jira user's email address to assign issue TST-123 to that user. The first example will apply the FixVersion 2.9.6 to the TST-456 issue. The second example will apply the FixVersion 2.9.5 2.9.6 to the TST-456 issue. The third example will apply the FixVersion(s) 2.9.5 and 2.9.6 to the TST-456 issue. The first example will apply the AffectsVersion 2.9.6 to the TST-789 issue. The second example will apply the AffectsVersion 2.9.5 2.9.6 to the TST-789 issue. The third example will apply the AffectsVersion(s) 2.9.5 and 2.9.6 to the TST-789 issue. then adds the comment text to those Jira issues. * – Jira Server functionality will be added at a later date. Open an issue and click View Workflow from the context of the issue (near the issue’s Status). When you hover a status - it will highlight available transitions. This is the transition name that is used in Smart Commits and not the status name. Only letters and "-" (dash) are valid for workflow transition names for Smart Commits. Any other characters are treated as invalid. Smart Commits will ONLY use the valid characters before the occurrence of an invalid character for processing. When adding transitions in the Workflow editor, make transition names simple and easy to remember. Only use letters and only one space between words. A smart commit helper indicator is displayed to the right of the user/commit author. COMMIT The Smart Commits setting is enabled for the repository but there is no smart commit keyword in the commit message. SMART COMMIT The commit message has a valid smart commit structure and was successfully processed. SMART COMMIT ERROR There was an error during smart commit processing. For example, invalid keyword; commit author and Jira user are not the same; permission issues or wrong values. for any smart commits that were made before Git add-on v2.9.3. for smart commits that were ignored due to Smart Commits setting for that repository is disabled. for smart commits that have not been processed yet. for processed commits with ticket ID but without smart commit keyword when Smart Commits setting is disabled for that repository. The committers’ email address in the git configuration must match with the email address of the corresponding Jira user (or vice versa) for the smart commit to work. The Jira user must have the appropriate project permissions to transition issues. When you hover a status on the Issue Workflow - it will highlight available transitions. This is the transition name that is used in Smart Commits. If a smart commit fails, an email notification is sent to either the Jira user, or to the Git user if a Jira user cannot be identified. To avoid conflict when transitioning issues, give a unique name to a workflow transition. When Smart Commits setting is disabled for that repository, the Git add-on will not show the COMMIT indicators. Starting v2.6.33 of the Git Integration for Jira add-on, support for multi-line commit messages for Smart Commits has been implemented. The commit status shown on the Issue page depends on the Smart Commits setting that was set at the time the commits were processed.